AleaSoft, July 26, 2018. 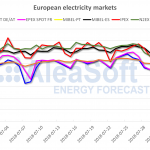 The lack of wind and the increase in demand due to the high temperatures of this time of the year are pushing the prices of the main electricity markets in Europe, and they are propitiating the increase of the prices of electricity futures. The prices of fuels for electricity generation remain high but stable, while the price of CO2 emissions rights keeps rising. 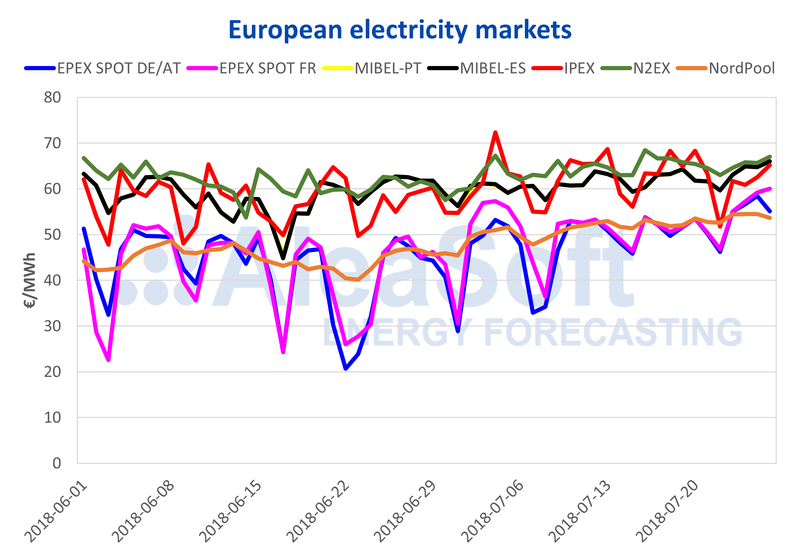 Electricity prices in the main European wholesale markets have been rising during the last weeks due to the low wind energy production and the increase in demand due to the high temperatures of this summer. In the first half of this week of July 23, the markets with the highest price increase have been EPEX SPOT from France and Germany, which are close to the level of the more expensive MIBEL markets (Spain and Portugal), Italy and the United Kingdom. United, according to the data analyzed by AleaSoft. The Nord Pool market of the Nordic countries is among the markets with the lowest price, even so, they are registering unusually high prices. In July 2017, the NordPool price was around 26 €/MWh, while this year they are already close to 55 €/MWh, more than double a year ago. Sources: OMIE, EPEX SPOT, N2EX, IPEX and NordPool. Electricity futures in the Spanish market OMIP continue in a bullish trend. Futures for Q4 have already exceeded 67 €/MWh, surpassing the record price of this product of 66.13 €/MWh registered at the end of May of this year. And the futures for 2019 have already surpassed 56 €/MWh. Brent oil futures remain below $75 a barrel and have not recovered from the July 11 drop when they were close to breaking the $80 barrier. For the prices of fuels used in electricity generation, July is still a relatively quiet month. Gas futures are still stable, around 22 €/MWh. And the price of API 2 European reference coal futures oscillates around $100 a ton since the beginning of July. Quite the opposite of the price of CO2 emission rights, which has not stopped rising since mid-June. Reference futures for December-2018 have already exceeded 17 €/t. Vandellós II nuclear power plant was connected back to the grid on July 24, after four and a half months, although it had to stop again in a few hours due to instrumentation problems. 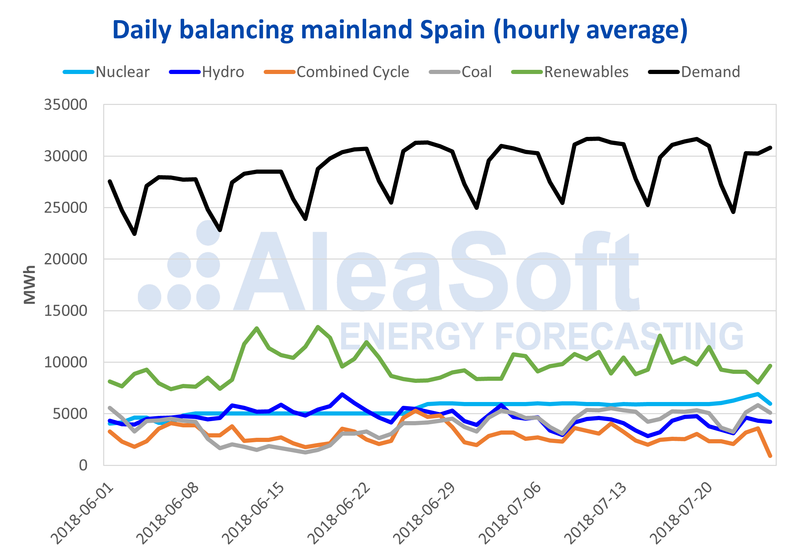 According to AleaSoft, the reconnection of the plant will exert a downward pressure on the market price, although it will not be able to compensate the upward pressure exerted by the increase in demand due to high summer temperatures and low wind energy. The plant is scheduled to reconnect on Sunday, July 29. The level of water reserves in hydroelectric dams continues to fall due to the seasonal decrease in rainfall during the summer. According to data on Tuesday, July 24, available hydroelectric energy decreased by 3.9% in the last seven days. 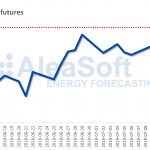 Wind energy continues below typical levels for this time of year and becomes one of the important factors that keep market prices high, according to AleaSoft. The demand for electricity remains high, due to the typical temperatures of this time of year. After the heat wave of the second week of July, temperatures on the peninsula have remained at historic levels. For the second half of the week of July 30, it is expected a significant increase of the temperature, in what could be a new heat wave that, according to AleaSoft forecasts, could lead to a new increase in demand and an upward pressure on the market price.